On the last day of our desert trip, we headed to the Cargo Mucho Mtns in the far southeast corner of the state. Though not the highest (which Tom Becht and I had visited in 2009), Stud Mtn is another P1K in the range I was interested in. A longish drive north from Interstate 8, we used an approach up the east side of the range that utilized a decent BLM road (though high-clearance definitely recommended) that got us within a mile of Stud Mtn on the north side. The road continues southwest into American Girl Wash, but a sturdy 4WD vehicle is needed for the rough road driving this would entail. We parked in a wide area off the road, studying the view of Stud's northern aspect some before starting out. We crossed a bit of desert flats before heading up a reasonable-looking gully to gain the NW Ridge. 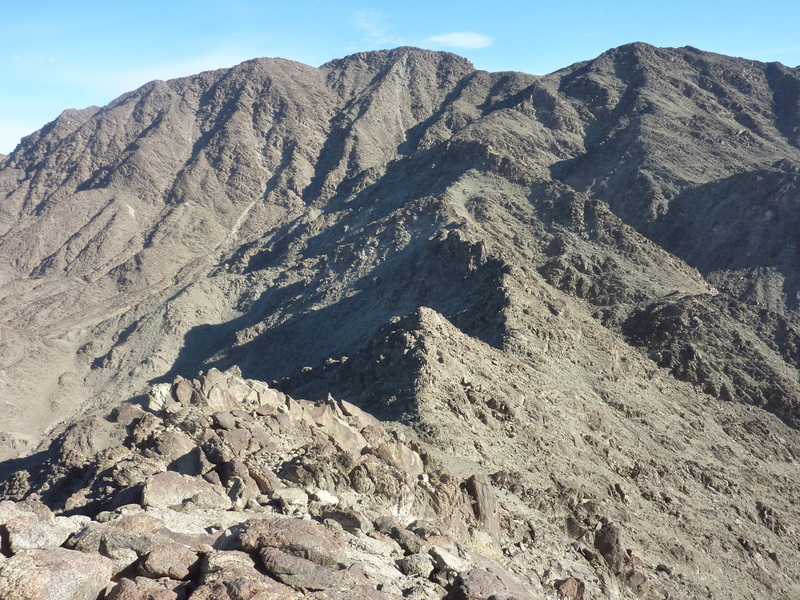 With some minor deviations, we followed this for the remainder of the climb, taking about an hour to reach the summit, found a short distance south of a false summit (Stud Mtn's highpoint can't actually be seen from our start). Various wooden pieces from the survey tower that once stood here have been bound up with wire in a summit cairn where we found a set of nested red cans left by a San Diego Sierra Club party in 2000. There were a few loose pages of earlier entries, the oldest to 1995. One odd page listed various members of the DeCorse family with birth and death dates, purpose unknown. There was a generic USGS benchmark (no identifying name marked on it, as per usual practice), but a nearby reference mark had "AMERICAN" stamped with a 1934 date. While taking a break at the summit, we looked southwest towards the other two peaks I had in mind for the day. The closer one, bonus Peak 1,422ft, seemed reasonable enough with a dirt road then descending north into American Girl Canyon that would make for an easy return. This seemed to satisfy Evan, who was looking for easy rather than hard, and he decided to join Matt and I at least that far. It wasn't until we had hiked along the connecting ridgeline for nearly an hour that we realized our mistake in identifying the bonus peak. We had climbed a slightly lower summit to the east enroute that had insufficient prominence to count itself as a bonus. Hiding behind it, Peak 1,422ft was another quarter mile to the west, requiring us to first drop 200ft to a saddle (where the mining road is located that Evan had hoped to take back). Had we known this ahead of time, Evan probably would have turned back, but now that we were this close he was resigned to continued. In descending the minor summit, we were helped by the discovery of a mine halfway down the southwest side. The mineshaft had a very good mine trail leading to the saddle with Peak 1,422ft that we were more than happy to take advantage of. From the saddle, more cross-country scrambling got us up to the bonus peak by 10a, only half an hour after leaving the minor summit. No register found here, to no great surprise. Our last summit, Pasadena Peak, was another 2/3mi to the west, with a drop of nearly 300ft inbetween. I noted there was another mining road climbing high up the east side of Pasadena Peak from its saddle and was quick to point this out to Evan as a way to entice him up the last peak. It worked, and better than we had expected too, since we found another mineshaft on the SW side of Peak 1,422ft with its own mine trail leading to the second saddle, much like we'd found on the minor summit. The trail heading up Pasadena Peak continued further than we had been able to make out from a distance and by following various branches were able to hike nearly to the summit using them. It was 10:45a by the time we reached Pasadena Peak. In contrast to the other two summits, this one had seen regular visits by non-peakbaggers. There was a large, stone windbreak constructed at the top, a rusting stove installed on one side. The open pit American Girl Mine is located about half a mile northwest of the summit. There are various other mines and roads/trails all over the mountain, making for a busier place back in the day. After our last break we started back, initially via the route we'd taken from the last saddle. I became intrigued by a route descending back down a canyon to the northeast, past an old prospect that didn't amount to much. Evan chose to take the more certain route back to the saddle while Matt followed me down the unknown gully. It turned out to have no hidden surprises like impassable dry waterfalls, but it did feature some bits of decent scrambling that made it worthwhile. We reconnected with Evan when we joined a mining road heading down from the saddle. Evan came wandering down the road only a few minutes after I'd reached it, while I was still waiting for Matt to finish up in the gully. Together, we hiked the roads down past old mine ruins and across several washes before finding the rough road that would lead us back to our vehicle.